David Drane was born on 28 March 1948 and was the only child of Henry and Mary Winifred Drane. Dave’s working career was quite diverse; he started off working in the SEC Show Rooms as a teenager in the mid 1960s, followed by the marketing department of the SEC Credit Union. He then ventured into his own business for four years at LV Sportswear in Morwell. This coincided with the privatisation of the SEC and evidently saw tough times for Dave. Following this, he spent 13 years employed by the regional sports assembly, known as Gippsport as its inaugural executive officer commencing the role in 1992. His love of umpiring then saw him employed by the VCFL Umpires Department as the umpires’ state-wide general manager. Following this he worked with Keenan and Sons – Stonemason. His last paid employment role was with the Australian Forest Contractors Association as Manager. One of Dave’s real strengths was his ability to mingle with all kinds and still leave an impression. It didn’t matter if it was the minster for sport and recreation, or the minister for forestry, the local priest, member of parliament, committee members of your local sporting club or a 13 years old kid running the boundary for his first game. He engaged with all and did it with ease. It is rare indeed for a man who has never umpired VFL/AFL football to receive one of the highest accolades the AFLUA can bestow on any individual – honorary life membership. David received this honour in in 1985 recognising his 20-year plus commitment to VFL umpires. 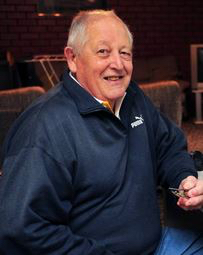 David umpired in the LaTrobe Valley, first for the Yallourn and Morwell football clubs and then as part of the LaTrobe Valley Football League Umpires’ Association. David would meet the train on a Friday night if a VFL umpire reported a player the previous week and transport them to the tribunal and then to their accommodation afterwards. On a normal Saturday, he would meet the taxi in Morwell and look after the VFL umpires who were umpiring in Morwell. He would take the umpires for dinner at the Morwell club after their game to wait for the returning taxi. On one occasion, he even drove an umpire back to Melbourne when the taxi forgot to collect him following a Sunday match. He went so far above and beyond what would ever be expected of a man in his position that the umpires at the time nominated him for honorary life membership. David was responsible for recruiting many young umpires from the Gippsland area into the VFL/AFL. He also agitated for the LaTrobe Valley Umpires’ Association to gain a prestigious entry into the UPD for a short period. David was President of the LVUA between 1992 1994. He won an LVUA Award for outstanding services 1984. He was awarded Life Membership of the LVUA in 1987. David passed away on Sunday 15 May 2016 after a battle with cancer.